Alex Wong/Getty ImagesPresident Donald Trump. The trade spat between President Donald Trump and China is heating up, with tariff threats escalating. Comments from top officials in the Trump administration suggest the trade tensions will not dissipate anytime soon. Economists think the size of Trump’s newest trade threats risk putting an even bigger dent in the US economy. President Donald Trump increasingly seems headed toward a trade war with China, and US consumers could soon start feeling the squeeze. The battle between Trump and Beijing has kicked into high gear over the past week. The two sides traded back-and-forth tariff threats on $US50 billion worth of imports on Friday, and then Trump on Monday threatened tariffs on another $US200 billion worth of imports. While the threat of a new massive tariff is just that – and the earliest any of those tariffs are set to take effect is July 6 – the Trump administration’s antagonistic rhetoric toward China appears to indicate that the battle isn’t going to end anytime soon. Peter Navarro, Trump’s most protectionist trade adviser, blasted China during a briefing with reporters on Tuesday. He said China’s previous attempts to defuse the situation – China reportedly offered to purchase billions of dollars’ worth of US agricultural and energy products – were not enough. Navarro also indicated that no trade talks with China were planned but said the administration was willing to hold discussions. “Our phones lines are open – they have always been open,” Navarro said. Less hawkish members of the Trump administration have echoed Navarro’s thoughts. Secretary of State Mike Pompeo attacked China on Monday during a speech in Detroit. Despite the harsh words from high-level officials, Navarro tried to downplay the economic downsides of the tariffs, calling them “relatively small” and insisting the eventual results of the fight would be positive. “Our view is that these actions are necessary to defend this country and they are ultimately bullish for corporate America, for the working men and women of America, and for the global trading system,” Navarro said. Caught in the middle of the fight between Trump and Beijing are US consumers and businesses. “Let’s hope that Americans wake up in time to understand this reality that they, not the Chinese, will be the ones hurt the most by their president’s insistence that they should pay high prices for imports, including those that are used by many US manufacturers,” Veronique de Rugy, a senior research fellow at George Mason University’s Mercatus Center, said Tuesday. Tariffs drive up the cost of goods coming into the US, forcing businesses to pay more for imported goods or buy more expensive domestically produced goods. This causes costs to increase for businesses that use those goods as parts for their final product. In turn, these firms must either absorb those new costs or pass down price increases to consumers. The Deutsche Bank economists Brett Ryan, Peter Hooper, and Matthew Luzzetti found that the tariffs introduced by Trump could push up inflation and result in a drag on economic growth. “Our analysis indicates that such a further escalation of the trade dispute to include $US200 billion of imports could reduce real GDP growth by roughly -0.2 to -0.3 percentage points,” the trio said in a note to clients. In essence, they said, consumers are likely to pay more for goods that are subject to tariffs and buy less as a result, which would slow the growth of the US economy. 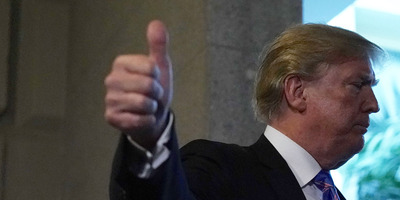 Gregory Daco, the chief US economist at Oxford Economics, estimated that Trump’s newest tariff threat, on $US200 billion of Chinese goods, would shave 0.3 to 0.4 percentage points off gross domestic product. He cited two reasons it posed an even larger indirect problem for US firms. “First, the tariffs on $US200 billion of imports would affect a wide array of business sectors including some with significant supply chain multipliers (i.e. sectors where each dollar of activity generates more than a dollar of activity in other sectors),” Daco said. Several industry groups covering everything from auto manufacturers to winemakers sent a letter to GOP lawmakers urging Congress to step in to block Trump’s tariffs. Even the Business Roundtable, an influential business lobby, urged the president to step back from the trade fight. But the ongoing rhetoric between Beijing and the Trump teams has left little hope for a quick solution. “There will likely be no rest for the weary among trade warriors and their watchers in the months ahead,” the Deutsche Bank economists said.